Laser safety involves the process of using policies when it comes to safely designing, using and implementing laser to reduce the risks of suffering from laser accidents especially those that negatively affect the eyes and result to eye injuries. Keep in mind that even the smallest amount of laser light is already enough to cause permanent eye injuries. This is the main reason why the process of selling and using lasers is subject to the adherence of government regulations. Moderately and highly powered lasers are extremely hazardous because of their ability to burn your skin and your eye’s retina. As a means of controlling the risks associated to facing injuries, you need to familiarize yourself about the different specifications that are now used in defining laser classes based on wavelength and power. The safety regulations and measures associated to the use of lasers include wearing laser safety goggles during the operation of lasers and labeling lasers with warnings. There are now a lot of guidelines used in the implementation of laser safety measures. One of these is that everyone who is responsible in using lasers should increase their awareness about the risks of using the said materials. Another guideline is that all watches and jewelries should not be brought inside the laboratory. It is also important for you to use adequate eye protection by wearing a protective eyewear. It is also advisable for you to guide high intensity beams that may result to skin damages or fires through tubes. If you have longed to master everything about laser safety, then enrolling in the laser safety certification program which is now introduced by Brainmeasures to the public is the best move that you can ever take. The reason behind this is that Brainmeasures, with the excellent reputation and positive reviews that it continuously receives as an effective online certification company, can guarantee you that everything is covered in the laser safety course that it offers. By taking part in this online certification program, you will be able to enjoy a comprehensive laser safety training which covers all the aspects associated to using lasers including the hazards and risks that are associated to their operations and the different safety and precautionary measures that you should follow. You can also expect the laser safety certification course to offer information about the most effective tools that you can use in keeping yourself safe when using lasers. As a holder of the laser safety certificate provided by Brainmeasures, you will have an easier time proving to the public that you have indomitable laser safety knowledge and skills. 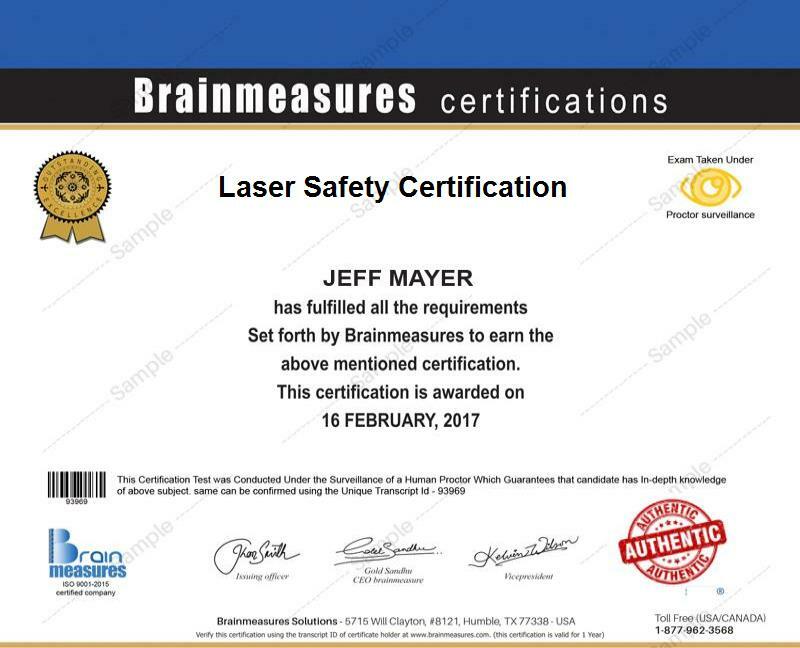 The laser safety certification program which you can now easily access at Brainmeasures is a huge help to a lot of people especially those who are regularly tasked to operate laser devices. This certification course can be expected to work perfectly for laser equipment operators, mines inspectors, laser safety officers, technicians, safety professionals, engineers and any other individuals and professionals who are required to perform tasks with the help of lasers including welding, drilling, cutting and marking. You can also expect to notice a dramatic increase in your salary after your successful completion of a laser safety certification course. You can actually use your laser safety certification to work as a laser equipment operator which allows you to receive a minimum of $47,000 annually. If you decide to get the position of a laser equipment operator, then you can expect to start receiving around $72,000 to $117,000 every year.